Welcome to my front porch in summer. The weather has been glorious, cool in the mornings and warm in the afternoons. Perfect for “setting a spell”. Walk on down the pathway to our front door . . . under the apple tree, through the bird feeders, and past the bubbling fountain. This is the porch swing that Mr. OTN and a friend hung for me last summer. I purchased the seat cushion from World Market and made pillows out of outdoor fabrics. I was planning on sewing cord covers for the chains until I saw what Laurie over at Heaven’s Walk did with her porch swing. Her “whimsical gypsy swing” is gorgeous. I think she did a lot more wrapping of the chains on hers, and she has wonderful flowy curtains on her porch and . . . well . . . you really should just go over there and take a look. Don’t forget to come back though . . . her blog is addicting! This was so easy to do. I simply tore strips of leftover fabric and started tying them onto the chains. Aren’t they pretty when they blow in the breeze? My Rosette Wreath is still hanging on the porch but I’ve added a wild grapevine wreath behind it for more layering. If you haven’t seen the tutorial for this wreath you can link up HERE. Next to my swing is a 3-tiered succulent planter made from a Goodwill find. Directions for this are also on a previous post that you can find it right HERE. a lantern and a driftwood wreath. No tutorial needed for this wreath. I simply made it by glue gunning pieces of gathered driftwood onto a purchased grapevine wreath. I won’t say it was hard to do but I did tear it apart a few times to get the driftwood to look like it had collected naturally into a pile rather than being perfectly placed. Perfection is my enemy! with one of our Beagles, Cozy, contemplating escape, and our porch guard dog, Beauregard. He is often relegated to holding the collections I bring home until they dry out and the bugs crawl away. I’m so happy you came by for a visit and I really hope you’ll come back soon. There is always something new happening at our place! Last weekend I went on a “great explore!” I’ve mentioned in previous posts that I’ll be participating in my first ever French Flea Market in September, so when I heard that Haley’s Cottage in Kirkland was sponsoring a French Inspired Flea Market I was ready to put on my Big Boots (sandals actually) and hit the road. I grabbed my friend Linda, who will be sharing a booth with me, and our two hubbies, who may be helpful with set construction (fingers crossed) and off we went on our adventure! Here is a peek at some of the pretties we saw! Isn’t this emerald green couch great? They were literally stepping in to cart it away while I was snapping it’s picture. I did a little oohing and awing over these succulents in pewter pots! While Mr. OTN was schmoozing (one of his favorite things to do) he ran into this sweet couple visiting all the way from Tennessee. A fellow blogger and photographer I had to have a picture! See the old film reels she’s holding? She found them for the wall of her studio at JenniferLawrencePhotography. and these two chairs made over into a bench. A very OldThingsNew kinda thing to do! One booth had so much vintage jewelry that I didn’t know where to start. I got a little stuck here and ended up with a pretty broach to go on my ragged old jean jacket. A few of the vendors kindly let me take their pictures displaying their wares. Thanks ladies. This was my favorite piece of the day with all of it’s distressed wood, rusty parts and mismatched pulls. Beautiful! At the end of our shopping day Mr. OTN made me pose for a picture myself . . . a little distressed, rusty and mismatched also. Where were you Linda? It was a good day and I came home super motivated to get to work on my own projects. 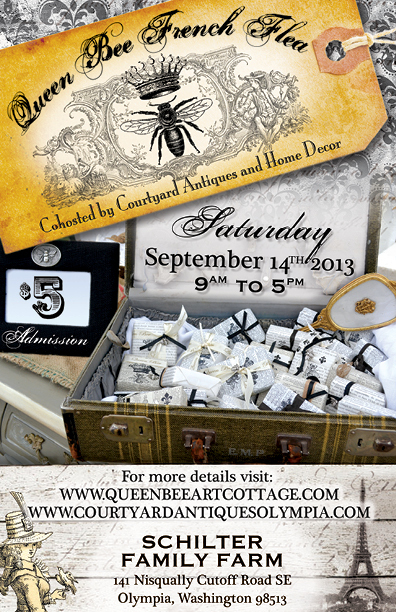 If you are in our area be sure to mark your calendars for the Queen Bee French Flea in September!